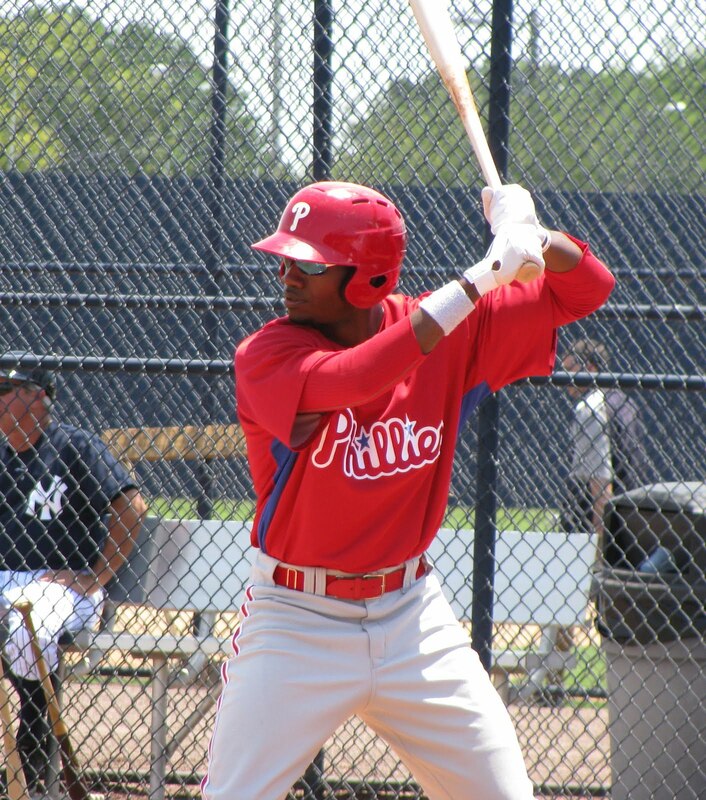 hile the nation was focused on the big league All-Star Game on Tuesday, some noteworthy rehab activity was going on in the minor for the Phillies. Reliever Justin De Fratus, top prospect Domonic Brown and minor league outfielder Tyson Gillies all saw game action, after some lengthy absences from the diamond. Firstly, with the Gulf Coast League Phillies completed a suspended game from Monday by downing the Blue Jays team 5-4 in the morning hours. Following that, in a shortened seven-inning affair that the Phils won 7-3, right-hander Justin De Fratus (pictured, right) started and threw a scoreless inning, allowing a hit while striking out one batter. De Fratus has been sidelined with a strained flexor tendon in his throwing elbow. The 24-year-old had previously thrown a simulated game on Saturday, which was his first time facing hitters since April 22nd, when he threw for Class A Advanced Clearwater. 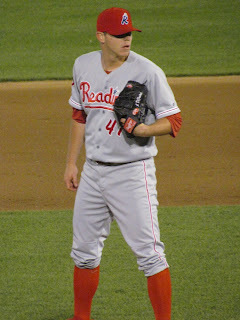 De Fratus, the Phillies' 11th round draft pick in 2007, made his big league debut last September and posted a 1-0 record and a 2.25 ERA in five appearances. The Oxnard, CA native could be a welcome addition to a struggling Phillies bullpen, if he can get back to full health. Also with the GCL team, outfielder Dom Brown (pictured, left), who has been dealing with a knee sprain since mid-June, served as the club's designated hitter and went 2-for-3 (single, double) with a walk, a stolen base and two runs scored. The 24-year-old had posted a .266 batting average with four homers and 22 RBI in 47 games with Triple-A Lehigh Valley, prior to experiencing the injury. 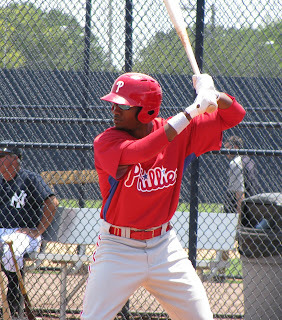 Brown was selected by the Phillies in the 20th round of the 2006 amateur draft. In 91 big league contests, the 6-foot-5-inch 205-pounder has posted a .236/.314/.382 line. Tyson Gillies (pictured, right), the speedy outfielder acquired by the Phillies in the 2009 Cliff Lee trade, has been out of action with a concussion since he collided with teammate Jiwan James while fielding a ball in late May. Making an appearance with the Class A Lakewood BlueClaws, Gillies played center field for five innings and went 0-for-2. The 23-year-old is expected to play for Lakewood again on Wednesday. Phillies director of player development, Joe Jordan, wanted Gillies to see game action as soon as possible this week. The Double-A Reading Phillies, where Gillies normally occupies a roster spot, are on their All-Star Break, so Lakewood was an easy choice for the Vancouver native to get some at bats in the meantime. Lakewood outfielder Kyrell Hudson, who suffered damaged tendons in his right hand last week, will undergo season-ending surgery on Thursday. Hudson, the Phillies' 3rd round draft choice in 2009, had posted a .224 average with 1 HR, 21 RBI and 23 stolen bases in 64 games this season.